Product information "Easy Kit XC83x"
SPD (single pin DAP) via USB with on-board mini-wiggler for debugging. 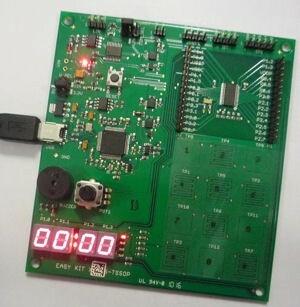 Application Example: : Alarm clock application with four 7-segment display indicating date or time, and a buzzer for sounding alarm when preset time has reached. Related links to "Easy Kit XC83x"
Customer evaluation for "Easy Kit XC83x"